I was also able to go back to Sister Freda’s Hospital. She was wonderful as usual and her heart for the sick and hurting never ceases to amaze me. I went into the room where the sick children stay and was blown away when I saw Baby Anne. 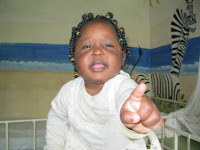 She was brought into the hospital on my trip last year with her mother, who was very young and very sick herself. Her mother had to go back to her family so Anne stayed behind at the hospital She weighed about ten pounds at six months old and was sick with Tuberculousis. They were scared that she would not recover, but under the watchful eye of Sister Freda and her staff she now looks great. The picture on the left is that Anne looked like when she first came to Freda’s and this is what she looks like now. She is adorable! Today I got to return to Purpose Driven Academy. This was one place where I spent a lot of my time last year helping out the school and spending time getting to know the kids that go to school there. We drove up to the church in the back of a pick-up truck and the first kid that I saw was Junior. He was one of the kids that we picked up last year and took out of a bad living situation and brought them to school. These kids had only one outfit and had never set foot in a school before. I was so excited to see him and he looked just as excited. As soon as my feet hit the ground he threw his arms around me and gave me a huge hug. 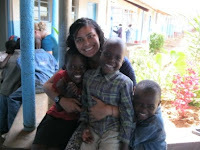 Shortly after I was greeted in the same way by many of the other kids that I had made relationships with. This picture shows me with (from right to left) Stella, Junior and Elizabeth. Just a few of the many great kids that board at Purpose Driven Academy. I cannot even begin to describe to you how good it is to be back. It seems as if I had never left and that nothing has changed except the kids are taller than they were the last time I saw them. Thanks for taking time to time check out my blog. Stay tuned! 6 Responses to Karibu Kitale! This all sounds so great. We are so proud of you!!! Fun to read about what you are doing! the mish is mean, she didn’t even tell me about this blog!